How much does it really cost to eat a healthy diet? Economists, health researchers and consumers are struggling to answer that question as food prices rise and the economy slumps. The World Bank says nearly a billion people around the world live on a dollar a day, or even less; in the United States, the daily food-stamp allowance is typically just a few dollars per person, while the average American eats $7 worth of food per day. 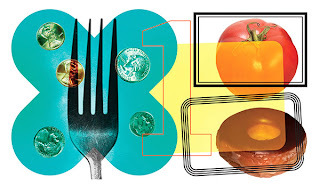 Even middle-class people struggle to put healthful food on the table. Studies show that junk foods tend to cost less than fruits, vegetables and other healthful foods, whose prices continue to rise. Breakfast consisted of oatmeal; lunch was a peanut butter and jelly sandwich. Dinner often consisted of beans, rice and homemade tortillas. Homemade pancakes were affordable, but syrup was not; a local restaurant gave them a few free syrup packets. One of the biggest changes was the time they had to spend in meal preparation. While he lost weight on the budget diet, Mr. Greenslate said, the larger issue was his lack of energy. During the experiment he was no longer able to work out at the gym. A few times they found a bag of carrots or lettuce that was within their budget, but produce was usually too expensive. They foraged for lemons on the trees in their neighborhood to squeeze juice into their water. Ms. Leonard said that after the 30-day experiment, one of the first foods she ate was a strawberry. “I almost cried,” she said. The couple acknowledged that the experiment was something of a luxury, given that many people have no choice about how much to spend on food. The experiment in California was hardly the first of its kind, though the teachers’ budget was tighter than most. Last month Gov. Jennifer M. Granholm of Michigan and her family took a weeklong “food stamp challenge,” spending only $5.87 per day per person on food — the Michigan food stamp allotment. She told reporters that she ended up buying a lot of macaroni and cheese. Last year Gov. Theodore R. Kulongoski of Oregon lived for a week on his state’s $3-a-day food stamp allocation. Ms. Leonard and Mr. Greenslate, who chronicled their dollar-a-day experience on their blog, onedollardietproject.wordpress.com, say they are looking at other ways to explore how difficult it is for people with limited income to eat a healthful diet.